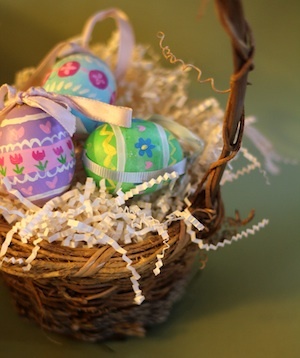 Ashbee Design: Meet My Easter Eggs! This following group is done with the classic grocery store dye of twenty something years ago. 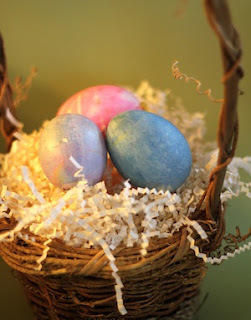 It creates dull pastel colors- generally blotchy but these were made with my kids. Only three left of this group. Years later the dyes improved. The following batch has lasted the best. It is the speckled set and created great lasting colors. No skill was required and these really pop visually in the bowl. One year I tried hand painting designs but my skill level wasn't up to par. It requires a free flowing sure hand and I am just too stiff with a brush. A friend gave my daughter, Karen a carefully decorated egg done with a colored Sharpie marker. 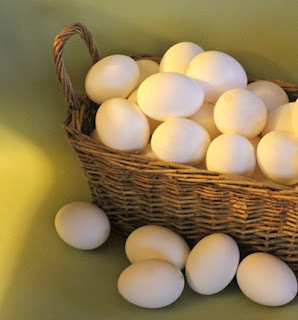 I copied the technique and was able to create a better design with this technique but each egg took a very, very long time. 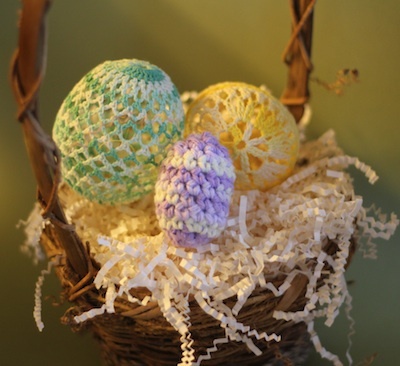 Also in my collection is a variety of hand crocheted eggs from my sister-in-law, Ann. 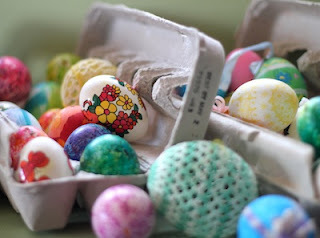 She is skilled in many needle crafts which I am not but her eggs add beautifully to the diversity. And now the challenge..... I want to add a new type of decorated egg to my collection. Thoughts? They are all so pretty; what a lovely range of colours and styles! 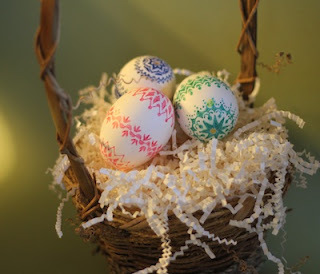 I went to a Christmas craft sale some years ago and saw some eggs covered in stretch velvet and trimmed with fancy braids and ribbon roses, and other red, green or gold painted eggs were covered in lace, the outlines of the patterns picked out with glitter. 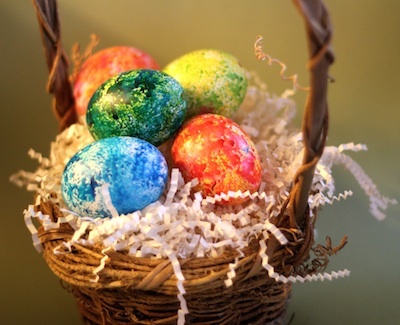 Perhaps you could adapt one of these to the Easter theme? I would love to see your take on the lace covered eggs. Art in the Bathroom? Absolutely!